Virtually all of the materials we collect and recycle are priced to just cover the expense of appropriate recycling or disposal. It is part of our mission to provide these services to the community, and remove these materials from the waste stream. 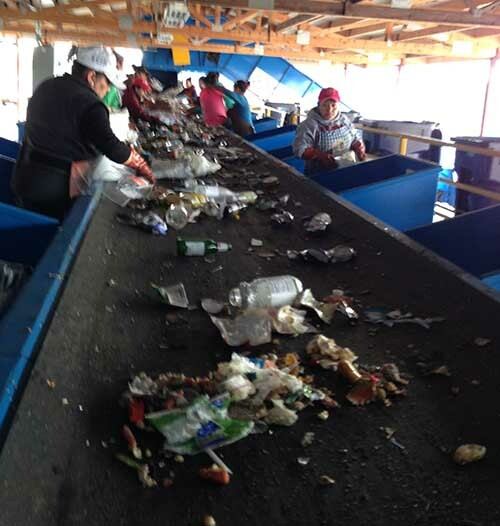 San Juan County shifted away from sorting recyclables a decade ago, as the industry shifted to co-mingled recycling, where you just throw everything (paper, plastic, steel, aluminum, glass) into one can. This reflected the move towards better and better “MRFs” or Materials Recovery Facilities—that use all kinds of high-tech machinery for sorting out all the recyclables. We currently ship our comingled recycling to Waste Management’s Cascade Recycling Facility in Woodinville WA. There our materials are sorted mechanically and by hand and compacted into large bales. These bales are commodities that then enter a complex brokering system. Much of the material ends up in Asia. There are many problems with co-mingled recycling. It costs our community more, because we are not sorting it ourselves. Also glass no longer has any real value as a recyclable commodity–therefore we pay to recycle glass. The Exchange intends to re-introduce source separation for recyclables in the near future. We hope to accept sorted recycling for free or at a discount, and continue to charge for co-mingled. In fact, we are starting out now with aluminum! We collect and recycle virtually every kind of appliance. Using various local contractors we transport all appliances off Orcas to be recycled as scrap metal. We pay to have them removed, and thus we charge for the service. Refrigerated appliances cost more because a trained technician must remove the components containing Freon, a hazardous chemical waste. ORS/The Exchange became an official member of the state E-cycle program in 2015 and can now accept TVs, CPUs, and computer monitors at no charge. Televisions and computers contain a host of toxic substances such as lead, cadmium, mercury, and arsenic. It is great that these items are now properly recycled. We have to pay to recycle small electronics like stereos, VCRs, disc players, and computer peripherals like printers and scanners. So we charge a small fee to cover our costs. The Exchange recycles all types of batteries. We charge $2 per pound for most, with the exception of vehicle batteries (lead-acid) which we take for free. Lead-acid batteries, as well as rechargeable computer, phone and power tool batteries all have value in the aftermarket. However the vast majority (90%) of the batteries we receive are household alkaline batteries which we have to pay to recycle. The Exchange uses the revenue from the good batteries to underwtrite the cost of accepting the alkaline batteries. For a complete rundown on batteries, and a guide to identifying them click here. Fluorescent tubes contain mercury, a powerful toxin. They truly need to be handled safely. Washington State recently passed a law that requires these to be properly disposed of. In 2015 a lightbulb manufacturer sponsored program went into effect that will pay for the disposal of these bulbs. Anyone with any sense will agree that it is ridiculous to ship compostable materials off of an island. On our way to a comprehensive composting program, we are starting out with our Clean Green collection. For a drastically reduced price, you can bring your totally green and noxious weed free material to us. A local contractor grinds it up and composts it here on Orcas Island! To participate you must fill out and sign our Program Agreement form, which you can download from this page. The used motor oil we collect goes to one of two places: San Juan County Public Works Department, or an off island refinery. The County uses the oil as fuel for heating their large equipment storage buildings. The mainland company refines it an turns it into “bunker fuel” which is is used in the shipping industry. We store tires on site until they are collected in bulk for recycling. We are excited to introduce latex paint recycling to Orcas! Gather up your old, leftover, or unwanted latex paint (liquid form) and drop it off for a small fee. No oil-based paints will be accepted. Learn more about the program here.